This summer, Weston Scarves are collaborating with Burt’s Bees in a campaign to support the British Beekeepers Association, with the creation of a stunning ‘Wild for Bees’ floral printed scarf and matching, special edition version of their 24 hour Milk and Honey body lotion. The beautiful yellow, purple and green scarf, which is over a metre long, is being sold exclusively through the Burt’s Bees website, with all proceeds going to the British Beekeepers Association‘s ‘Adopt a Beehive’ project. It’s a seriously gorgeous scarf, I covet it so much. If you bought one, not only would you feel great about supporting the charitable campaign but you’d never want to take it off! 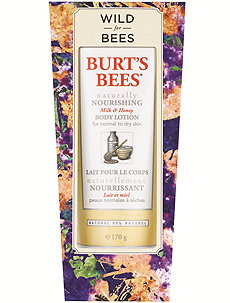 You can buy the body lotion nation-wide from Debenhams, the Burt’s Bees website and independent stores. I’ve tried the lotion and it feels very light, absorbs easily and really does soften the skin very well. Along with the milk and honey, it also contains shea butter, coconut and grape seed oils and vitamin E, so there is no surprise that it does such a good job. I liked it a lot. I’ve written before about the plight of bees and every single project that is making a contribution to their recovery gets my full support. As an allotment holder and keen gardener, I’m only too aware of the importance of all bees as pollinators. Approximately a third of the food we eat has been pollinated by bees, so whether you think it matters to you or not, the survival of bees is vital for everyone. This campaign, working to support honey bees in particular, will hopefully raise the profile of the British Beekeepers Association and the work they do in supporting bee colonies. The limited edition scarf and body lotion will be available throughout August and September. With thanks to Burt’s Bees for the body lotion sample.